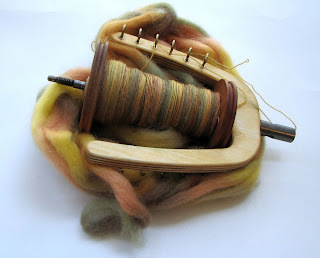 So I promised a spinning post so here it is. It may be a lazy one but I promise some nice fibery eye candy. I'll work with the present and work my way back. 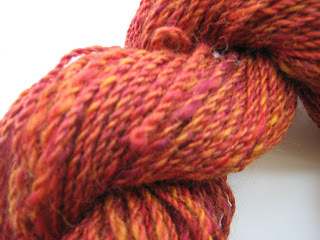 Right now I'm spinning some fiber that I purchased at Rhinebeck last year. I lost the ball band but according to my Rhinebeck post, this fiber is from A Touch of Twist and its about 2 ounces. Its pin drafted wool and basically spins itself. The singles are coming out to be roughly 23wpi and I have no plans for the finished yarn so who knows what it'll look like (see? lazy!). I may navajo ply it, I may ply it with something else, who knows. This fiber seems to be my "serenity now" comfort spinning. 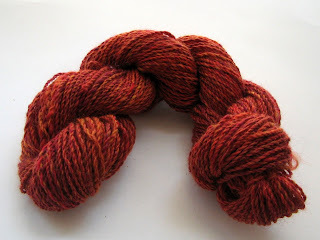 My other fiber offering is one that I mentioned in a previous post. 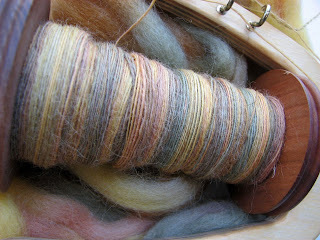 This was spun from a dilectable Grafton Fiber Batt that I received in a swap a while ago. I tried to spin it a little thicker than I normally do. I haven't had a chance to block it and measure the yardage (see? lazy!) but it weighs 2.6 ounces and is roughly 16wpi (about dk weight). The fibers may bloom a bit once its had a bath and whipped a bit. I'm thinking of making a winter hat for my little one, I just need to stalk ravelry for the perfect pattern. Speaking of little one, he attended his first day of school yesterday and I'm so proud of him (and myself for not crying). My baby's growing up, OK let me stop before I get all emotional. By the way, that is not his school in the background, I wouldn't want you guys to think that. Lastly I just want to mention a great site that Rosa put me on to. All I have to say is....Picnik...WOW. It's a great site for editing your photos, especially for us non photoshopers. I absolutely love it (can you tell?). I haven't really had a chance to play around with everything on there but I edeited all the photos in this post on Picnik. I also edited the photos in my shop too so go check em out. This is a short post because I'm headed to my knitting group at Barnes & Nobles so I'll catch you on the flip side. Poor, poor neglected blog. I blame ravelry, only because I want to deflect the blame off of myself. Yes, bad, bad ravelry indeed. I haven't been on Ravelry much lately either....well then I'll blame laziness, yup, thats who dunnit! I kid, I kid but I have been keeping my crafty self busy but first lets start with the big shindig Sahara and I hosted this past weekend. I'm speaking of our 3rd annual Sistah Friends Knitta-que. We got booted out of our regular spot on St Nicholas Ave so we scooted the party down a block or so. We still had a grand ole time and I think everybody left there a couple of pound heavier ( I know I did). Last but not least, Sahara, the brainchild behind this entire event. If she hadn't of dreamt this idea up 3 years ago, then we wouldn't have had a chance to connect and celebrate with our knitting cyber 'friends in our heads'. I thank you for that and all the energy and resources you put into making this event happen. Big ups! I thought I had a picture of Veronica but I guess I was too busy talking her ear off to pull out my camera. I appreciate all the sistahfriends that came out to represent, thank you for trekking all the way to Harlem in the name of Sistahhood. I must say that I am disappointed in all the no shows. I'm not gonna rant but the lack of consideration did get to me a bit. Anyhoo, thats about it as far as the event went. We're already brainstorming for next years event! Now on the the WIP's & FO's, Knitting & Crocheting, Spinning & Sewing. Actually there hasn't been any sewing, I was just trying to go with the flow. I'm working on two project right now, a stay at home project and a travel project. I've been working on my home project for a while now [goes to check ravelry], since June! Its a shrug I'm planning on rocking this fall called Primavera. The pattern is by the very talented (and friend in my head) Rosi G. When I first saw this pattern, I knew I had to have it. I casted on immediately and knit on it with a passion until it got to big to travel with. Hopefully I'll have it done by September. Here's my progress so far. My travel project is of course a pair of socks. I've gotten comfortable with doing them one at time. The trick to beating second sock syndrome is to cast on for the second sock immediately after finishing the first. I mean you can't even delay for a minute, believe me it works. The pattern is the Riverbed master pattern from Cat Bordhi's sock book. The leaf stitch pattern is #169 from the Japanese book Knitting Pattern Book 300. I'm love the pattern, love the yarn, love this sock. I should be done soon and on to the next thing. In between working on the shrug and starting these socks, I got a little obsessed with making .....washcloths. When I say obsessed, I mean, I made 4 in 4 days. Here's they all are but they may look a little beat up because my family and I have already started using them. I'm planning on making some more soon. This post is pretty long already so I'll save the spinning & crocheting for the next time I post. Hopefully that will be sooner rather than later. Till then, be breezy!